It was a Smurfday Birthday this year! And Crackerjack is now officially TWELVE years old! A few quick pictures from our party yesterday ... today we celebrate with family so I have but a few moments to post! 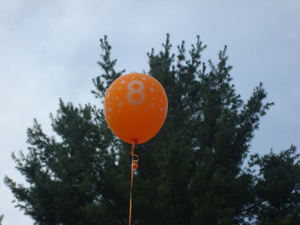 The balloons were actually supposed to be dispersed around the yard - along the fence, the trampoline, off the deck, etc. But we were running late and Bill brought them home literally moments before guests were scheduled to arrive. The list of "things to do" was consulted, and an ice-filled cooler and a grill ready-to-go took precedent over well-spaced balloons, lol! And here's the buffet table ... we had burgers and dogs, veggies and dip, macaroni salad, macaroni and cheese and assorted chips. Oh! And a "Smurfberry Punch!" I originally had a plan to display all the blue and white cupcakes (along with a red toadstool cupcake or two) on a tiered display something like this ... but alas, once again, time and toil got in the way of creative expression. Above you see my last minute variation. And why yes, I am wearing a "Smurfette" shirt. Well, I hope you all have a great weekend. I will be back tomorrow with another post (we have some happy news to share with you all) but for now I'm off to get ready for the next birthday party! What is your favorite Beatrix Potter tale? Is it the same as your kids'? Mine would be The Tale of Squirrel Nutkin, natch. Crackerjack and Earybird both like The Tale of Samuel Whiskers or the Roly Poly Pudding best, while Bookworm (who had to think back aways, lol) is partial to The Tale of Pigling Bland. And of course, whether indoors or out, an afternoon "Peter Rabbit Tea" would be fun! himself; he kept hearing noises. he should like to go home. Presently he dropped half the onions. 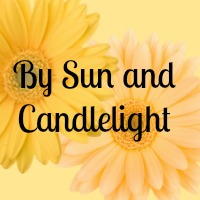 Now, I know this was two posts in one day - in a week I swore I'd be ever-too-busy to blog, lol - but I just had to let you all know about this special day just in case you'd like to plan something fun for your family tomorrow. I know many of us (homeschoolers especially) have spent countless hours immersed in the wondrous world of Beatrix Potter. She was a special lady - a brilliant artist and a gentle soul - and many a childhood was made all the more magical and memorable thanks to her dear little tales. We've been happily watching our little red squirrels - five in all at last count! Since it's been so hot here this summer, the squirrels have taken to "lounging" in the seed trays. The above is actually an action shot - this fella was feeding himself in this very position! It was too funny to watch. The raccoons have also made their presence known ... they're comical and so very clever. Another critter to look for at this time of year is the grasshopper. We find them on our house - walking across clapboards or as in this case, a storm door. We're pretty sure this is a Carolina Locust. Bookworm (who took this picture) said he had wings like a butterfly when he flew off. He also asked me if I thought we should alert the proper authorities considering the infamously destructive nature of these creatures. Lol. Above you see my most successful gardening venture this summer - my glorious morning glory vine! The basil and nasturtiums have also done well. The tomatoes, not so much. That's all for now, folks! I hope to be back again before the start of the new year (academic, that is). I have lots of planning to do and a school room to set up. Hope to get it all done before Labor Day! Be safe and well ~ and see you all again soon! Easy Treats for Cinco de Mayo! Preheat the oven to 350 degrees. Spread 4 plain flour tortillas with softened, unsalted butter. Sprinkle with cinnamon-sugar. Cut into triangles (or use fun cookie cutter shapes). Bake for 10 minutes or until crisp. Brew a small pot of herbal, kid-friendly tea (I used Little Citizen's Strawberry-Vanilla Red Tea). While the tea cools, fill a pitcher halfway full of fruit punch or juice (I used Welch's White Grape-Raspberry 100% juice). Add the steeped and cooled tea along with chunks of miscellaneous fruit (we added diced golden apples and orange slices). Let your "sangria" steep in the fridge for a while and then serve over ice. It sure is a day for smiles! Before I get into the party pictures, I first have to tell you first that we got our approval letter in the mail today! We are all set to homeschool again this year! This is a big relief - our town has gotten slightly more difficult in recent years. We've never had a real problem, but I've been kind of holding my breath waiting for something to come up. No such worries this year though - we're good to go again. 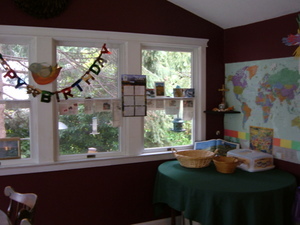 And, if you can believe it - and I hardly can - this will be our 10th year of homeschooling! The mascots (mix and match Lego minifigures). The candles (just a neat shot). 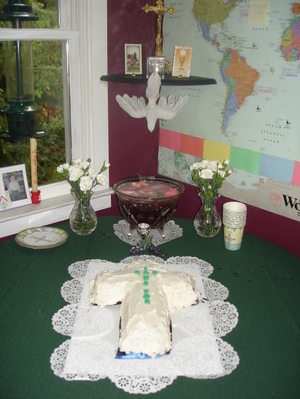 And the birthday cake - yes, I made it! :) Pan can be found here. I took this picture around 6 a.m. ~ the moon was still up, still glowing in the western sky this morning. Earlybird and I (the only two awake so far) have been marveling at it from our learning room windows. As we watched the clouds slowly pass over the bright orb, I pointed out the dark markings on the moon's surface and mentioned, casually, that we might be seeing the "Man in the Moon." 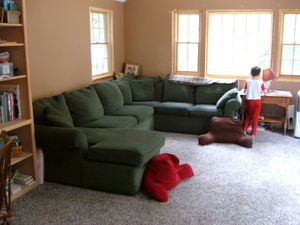 EB turned to me with wide eyes, and then fled the room. I think I significantly freaked out my youngest son for the day, lol. Well, yesterday was one of the busiest days we've had in a long time. 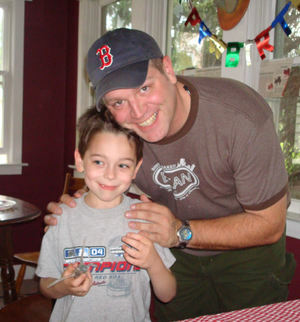 Bill was home for the day and we took the boys to our homeschool group's Valentine's Day party. It was loads of fun! 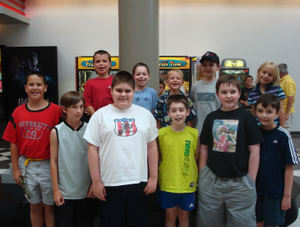 Later in the day, the older boys attended a birthday party while EB participated in his weekly social skills group. Dinner was a brief and late affair last night, and then it was early to bed! 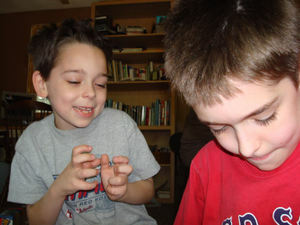 Today will be busy, too - getting ready for Bookworm's Activity Night which we're hosting this month. We'll have about 10 kids between the ages of 11 and 14 here for pizza and a movie. All this to say, I know posting has been brief this week, but it's been crazy around here! I have an "organization" post waiting in the wings ... hopefully I'll get around to that this weekend. And speaking of the weekend - I hope you all have a lovely Valentines Day! I will see you all again sometime soon. Needless to say, the kids play as the toons, and they get to pick their species, color, size, name etc. They then all work together (with other online toons) to "fight" the cogs with gags and funny jokes. It's an extremely child-friendly game (you can't communicate with the other players except by using toon talk); CJ almost always uses his allotted "video" time to play Toontown. Of course his brother plays it too as well as several of his friends, so that makes it all the more fun. OK, so there's the theme all explained, now here are the pictures! We had planned to have the tables set up on the deck, but a forecast threatening severe thunderstorms prompted us to move things inside (balloons and all). We even moved the galvanized tubs of drinks inside just in case. 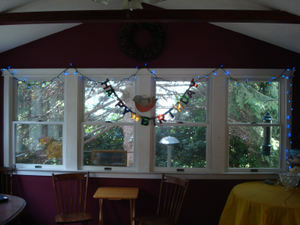 I laid vinyl placemats underneath that colorful plaid blanket to minimize any moisture problems. The tub on the left held water bottles and lemonade juice boxes. The one of the left had the "hard stuff" -i.e. sodas! 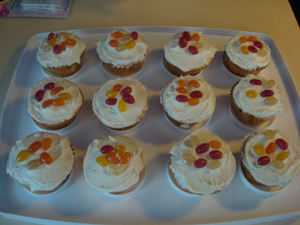 Here are the cupcakes just after decorating. I baked up a yellow cake mix (Feingold-approved) and frosted the cakes with homemade buttercream frosting. On top I sprinkled all-natural organic jelly beans (again, EB-OK). The symbolism is this: in Toontown not only do you throw cupcakes at cogs, but you collect jelly beans as "currency" which you can use to decorate your toon home and buy your toon clothing as well as new phrases or gags. 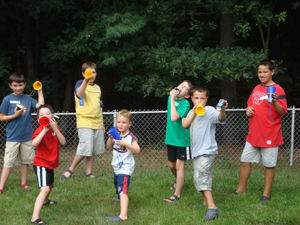 The next game involved water, always a hit on a hot day. This was reminiscent of a VBS game we had played last year. A wheelbarrow was filled with water and stationed at one side of the yard; across from it, equidistant, stood two buckets of the same size. 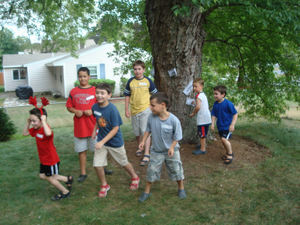 The kids were split into two teams and given paper cups. 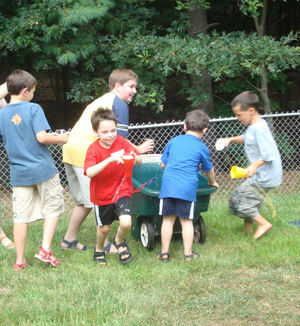 On go, they had to use their cups to move water from the barrel to their buckets. The team that filled their bucket first won. 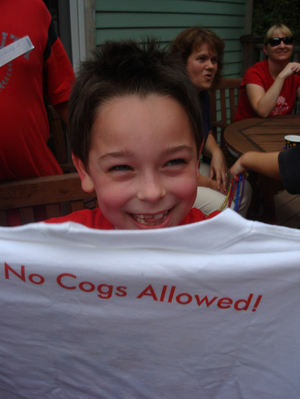 CJ received some cool gifts, including this Toontown t-shirt with a message for all cogs on the back! 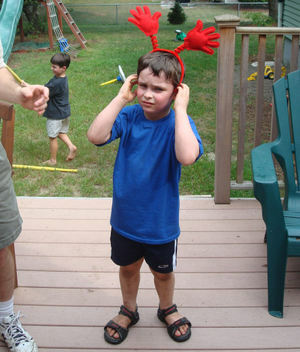 Crackerjack was insistent he needed this crazy red headgear for the day (the hands resembled toon hands, he said). He wore it for all of two minutes, lol! EB seemed just as "happy" to wear them, as you can see. Guess who ended up wearing them most of the day (mostly because I kept forgetting I had them on)? Cake time! And yummy cold popsicles, too. Crackerjack had such a great time, he loves being the center of attention! These were the favor bags we made up. 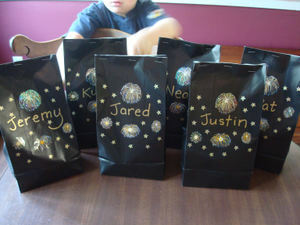 We started with black bags and decorated them with fireworks and golden star stickers. (On certain holidays, Toontown does fireworks every hour on the hour - my kids just love that part.) I used a gold metallic ink pen to write party guests' names. Inside the bags were all kinds of toon favors like marbles, jelly beans, duck beak whistles and paper money. Months and months ago, the boys and I were sitting at a movie (Flushed Away, I think it was) enjoying all the previews before the main feature began. The trailer for Ratatouille rolled, and Bookworm just lit up - he laughed and laughed and as the final screen flashed, Premiering Summer 2007, he turned to me and said, "Mum, THAT is what I want to do for my birthday next year - take everyone to see Ratatouille!" I have some pictures to post from our day, but I also want to share some of the party planning details with you. I know I love reading about how other mums pull off birthday parties (in fact that was how I got some of my ideas for our day, reading and gleaning inspiration online). So here goes. 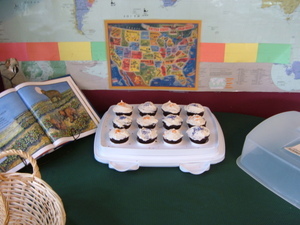 Well, we began with a general idea - a matinee show, followed by cake and punch back at home. As a major Disney/Pixar production, Ratatouille has practically a whole aisle devoted to it at the party store. I picked up a few items there, but tried to brainstorm a bit on my own. 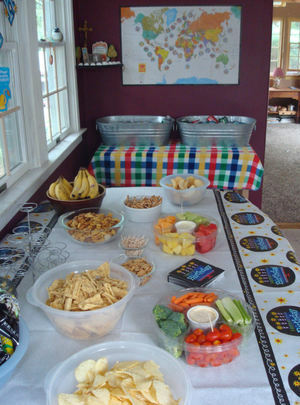 Now the logistics for a movie party can be tricky as far as informing your guests of the actual movie time. I couldn't get the show time till two days before the party, so I noted on the invitations that we would be seeing the "1:00-ish" show and that I would email the precise time as soon as I could pin it down. 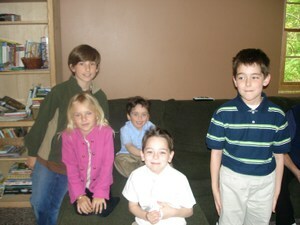 Our party was Friday, I had the movie start time (1:15) by Wednesday night and sent an email early Thursday morning. I asked our guests to meet at the theater at 12:45 in order to have plenty of time to organize and order snacks. To save even more time, I used an online ticket purchasing service. I tallied how many adults and children we would have, ordered the tickets and printed out one "ticket" for the whole party. I kept that piece of paper in my wallet. If you've read any of the Ratatouille reviews, it will not surprise you to hear that we all LOVED this movie. First of all, it was rated G and it is so hard these days to find a G movie. When we go to the movies, we go as families, bringing kids of all ages, so we want it to be something everyone can enjoy. Ratatouille appealed to all of us young and not so young - great story, plenty of laughs, visually amazing, and really very sweet. Look at these faces, can't you tell they had fun? OK, so now we all headed back home caravan style for the rest of the party. It was an exciting ride home, actually, because as we drove west, the skies began to darken and streaks of lightening flashed off in the distance. Literally, just moments after we all got safely inside, it began to storm like crazy. 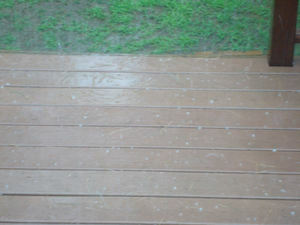 We even had hail! 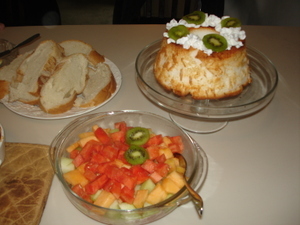 So, as Bookworm set about opening presents, Bill put out the snacks while I mixed up the punch and worked on remedying a cake catastrophe that occured while we were at the movie (more on that later). But for now, let me backtrack a bit to describe the food, favors and decorations. As usual we set up the two dining room tables for serving food buffet style - one for snacks and one for punch and cake. 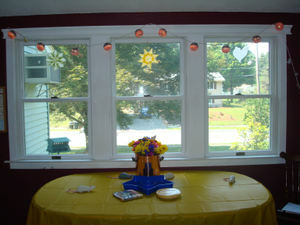 I purchased bright yellow plastic tablecloths for the tables, which, fyi, can be reused or recycled. I bought a couple of packages of Ratatouille themed cups, plates and napkins but supplemented with inexpensive plain yellow paper goods. For good measure, we bought some plastic rats to place about the tables (they ended up in the goody bags, lol). 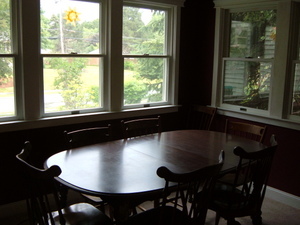 I also set up small tray tables and chairs to look like cafe seating. Later on, the above table was filled with cheese-themed snacks: cheddar mini crackers, cheese puffs, cheddar jack chips, and a cheese board with crackers alongside. We also had a veggie-and-dip tray and fruit salad served in yellow cups. 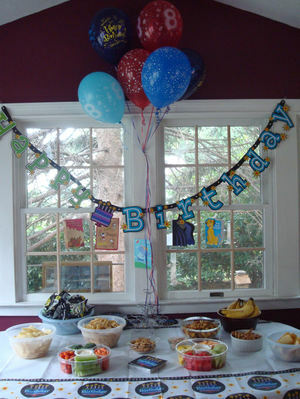 The soup pot centerpiece idea came from this wonderful birthday party idea site: Amazing Moms. 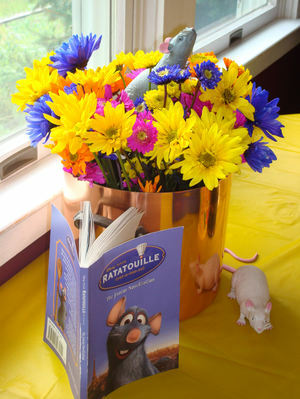 We used our copper stock pot and filled it with colorful summer flowers - but to keep things in theme, I perched a plastic rat peeking out of the flowers! 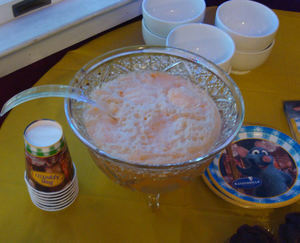 This was a blend of orange-pineapple juice cocktail, topped with scoops of vanilla-orange sherbet and a can of ginger ale to make it all frothy. Refreshing! All right, now about that cake situation. 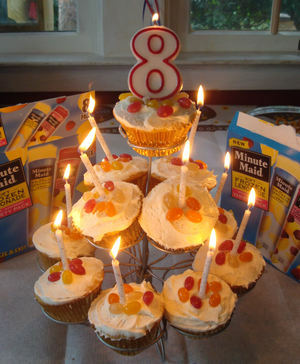 Bookworm's request was his favorite orange cake (Duncan Hines Orange Supreme). I had it in mind to bake it as a double layer cake and frost it to look like a cheese wheel. I made homemade buttercream frosting, tinted it yellow, frosted the assembled cooled cake and then we added circles of orange fruit leather. The hope was that it would call to mind Swiss cheese. 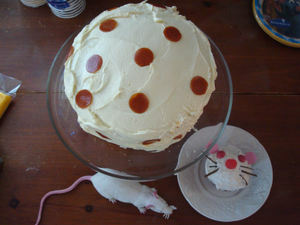 The plan was I would cut a large wedge out and place a small cupcake decorated like a rat inside the wedge. The rat cupcake has pink candy-coated chocolates for eyes and a gumdrop nose, black licorice whiskers and pink paper ears. Cute, right? When we returned home from the movie, Bill, who had stayed home with Earlybird (who cannot tolerate cinema movies - too much noise and commotion) pulled me aside for a quick de-briefing. Apparently, when he was busy cutting up vegetables, EB had a little fun pulling at the tablecloth - a bit too much fun, because he brought the whole cake plate (domed glass, mind you) over the side and on top of himself, crashing the plate and wrecking the cake, but thankfully not harming himself in the process. The sum of it all was: we were without a birthday cake. BUT! 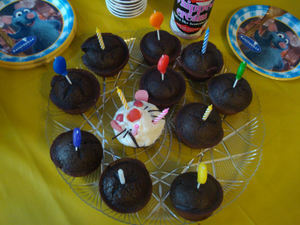 I remembered the extra cupcakes I had made, and fortunately the rat escaped much harm. (He lost a few whiskers but that was all.) 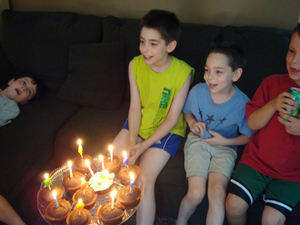 As it turned out I had exactly 12 cupcakes for 12 kids! I didn't have enough confectioner's sugar to whip up a new batch of frosting, so we used whipped cream instead. Bookworm was really a good sport about it. With a shrug of his shoulders he said, "Oh well. Can we bake an orange cake again later this weekend?" 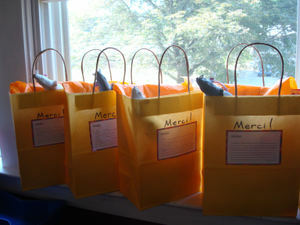 We bought plain yellow bags and orange tissue paper and prepared one bag per family. Inside the bags we tucked some Ratatouille candy, organic lollipops, Ratatouille stickers, a plastic "pet" rat, and an issue of a Kids Cooking magazine. On the outside we wrote Merci! (French for thank you) and attached a recipe card template on which Bookworm wrote his thanks. I had meant to also include a copy of a Ratatouille Activity Guide for each child but it slipped my mind. SO, there is our Ratatouille party - from soup to nuts! 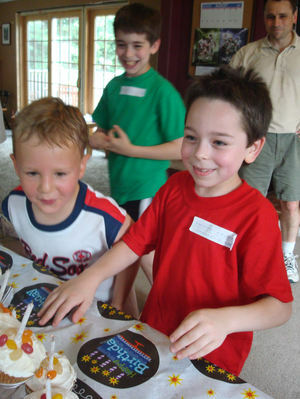 :) I hope you enjoyed a look at our party plans, and as always, thanks for stopping by. I hope you all have a wonderful weekend! 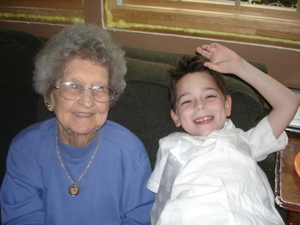 These pictures here are from our family gathering last night. My folks and my brother came over for a cookout supper and cake and ice cream (or, in this case, ice cream cake). Damee, my grandmother, wasn't feeling well enough to make it to the party, and Bill's folks are away for the summer (in Alaska, no less!) so I wanted to post a lot of pictures of the boys, especially for them. I also wanted to share the ice cream cake recipe with you all (it was so easy and yummy!) so I tacked that on the end. Not surprisingly, Bookworm got lots of help opening his presents. Here we have Earlybird, who was absolutely convinced this new notepad was for him. 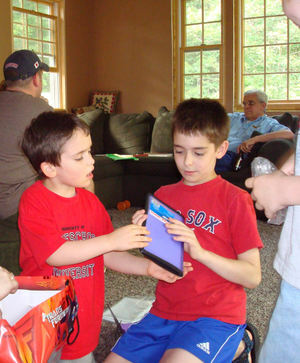 Bookworm was a good sport and let his little brother hold onto it while while he dug into the rest of the present pile. He was very excited to receive many new books from my folks - most of all I think for The Two Towers (the second installment in the Lord of the Rings trilogy). 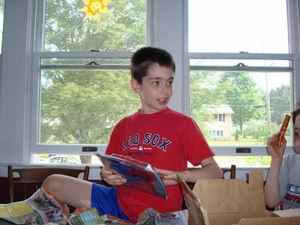 Bookworm received a package all the way from Alaska filled with birthday goodies from his grandparents. We all thought the rubbing of a petroglyph was cool, but I think he liked the Pokedex the best. Crackerjack and Uncle Matt. In case you can't tell, we're Sox fans around here. And here's a close-up of the ice cream cake. It doesn't look very fancy, but it was really quite delicious and refreshing. Bookworm found the recipe some time ago and kept it in mind for just this occasion. The original recipe called for peppermint ice cream and crushed peppermint candies on top, but we substituted mint chocolate chip ice cream and chocolate chips for the top. Not a bad trade, eh? Put the flour, cocoa, baking powder, and salt into the sifter and sift into a large bowl. Stir in the sugar with a whisk. In a medium bowl, using the whisk, beat the water, egg, oil and vanilla until blended. Pour the egg mixture and stir together with the whisk just until blended. Pour the batter into the prepared dish. Use a rubber spatula to scrape all the batter out of the bowl into the dish. Put the dish in the oven and bake for about 20 minutes, until a toothpick inserted into the center comes out clean. 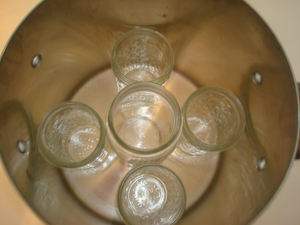 Using oven mitts, remove the dish from the oven and set it on the cooling rack to cool completely. 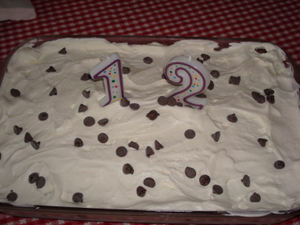 When the cake is cool, remove the ice cream from the freezer and set it on the counter to soften for 10 to 15 minutes. Drop large globs of the ice cream over the top of the cake with the rubber spatula and spread them out to make a thick, even layer. Cover with plastic wrap and freeze for about 4 hours, until the ice cream is hard. 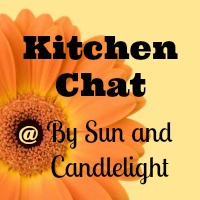 In a medium bowl, use an electric mixer on low speed to beat the cream, sugar and vanilla. When the cream begins to thicken and no longer splatters, increase the speed to medium high. Continue to beat until medium-firm peaks form, about 3 minutes. Spread the whipped cream evenly over the frozen cake with a rubber spatula, then sprinkle with crushed candies (or chocolate chips). Cut into 12 squares. Remove immediately from the pan with the metal spatula. Serve immediately or store in the freezer. Friends, Food and a Great Movie! What an awesome way to celebrate Bookworm's 12th birthday!! A fresh batch of chocolate cupcakes to celebrate BW's birthday. Just about six o'clock, the gang started arriving. Bill and Earlybird left to have dinner out and spend the evening at Nana and Papa's house, but Crackerjack got to stay with the "big kids." He was so excited to be included! Sorry this photo is blurry, but I had to show you our packed house! 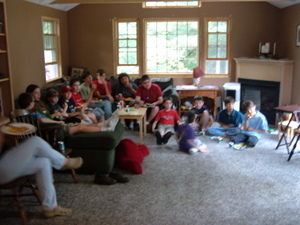 We had 14 kids in all, and several mums stayed to chat and visit. Above you see the group enjoying their supper as the movie started. Activity Night generally runs between 6 and 9 p.m. and as National Treasure is a long movie, I started it while they were eating. 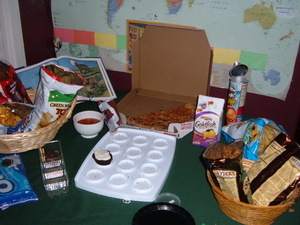 After the pizza, sodas and snacks followed, as well as plenty of cookies and cupcakes. We mums enjoyed tea, coffee and lots of conversation. 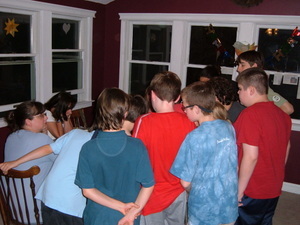 After the movie the kids gathered around my laptop to watch the trailer for the National Treasure sequel, Book of Secrets, opening this December. We're already planning a field trip, with perhaps a Book Group tie-in that month. And here we have the aftermath! Contrary to what this picture might suggest, we have TONS of food leftover! It was such a great time, and I was once again reminded of how blessed we are to be part of such an awesome group of people. 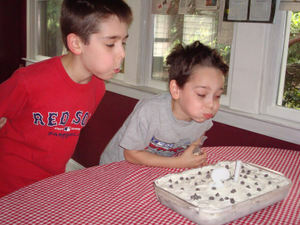 And now I'm off to make an ice cream cake for Bookworm's family party later today (pictures to come later!). Have a wonderful weekend, everyone! 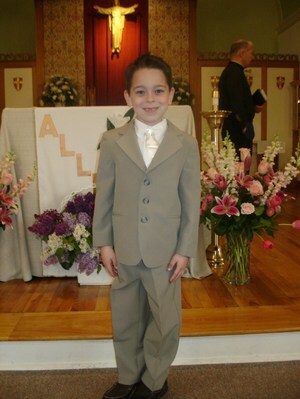 A BIG Post about CJ's BIG Day! How happy those early moments were as the church bells were ringing and the families were filing in ~ faces beaming, exchanging excited hello's and how-have-you-been's. All the children looked splendid in their special day finery. 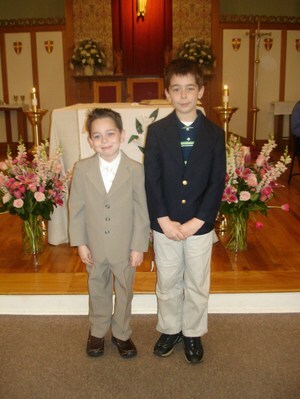 CJ wore the beige suit worn by his big brother just four years ago. The children making their FHC today each were assigned a pew, and at the end of each pew their personal banners were hung - the ones we made a few weeks back. They really looked lovely! Each one was unique and thoughtfully made. I'm happy to report CJ's withstood the storage - nary a sequin or felt shape was misplaced. Father's homily had the children laughing and quite involved. 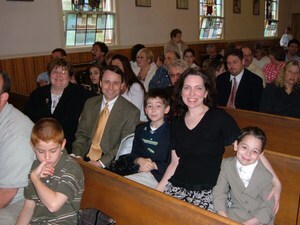 At one point several children were brought up in front of the altar (CJ included - he never misses an opportunity to participate) and asked to hold various items that one would bring camping. 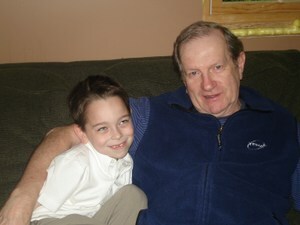 It might sound like a curious homily, but Father made a wonderful and memorable point. Watching these dear children receive the Blessed Sacrament for the very first time - hands folded, faces upturned - was just so beautiful. 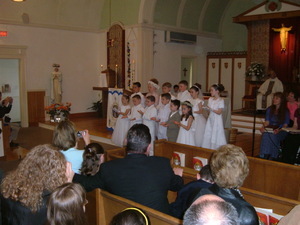 This picture was taken at the very end of Mass, when the children performed their special Trinity Song, the one they sang at the beginning of each class throughout the year. Before we headed home, CJ got to speak with our Pastor for a few minutes. 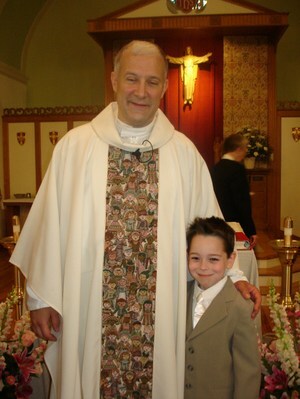 Don't you just love the panel on the front of his chasuble? Especially chosen for today, I would presume! Back at home it was time to celebrate with family and friends! Not surprisingly, the jacket quicky came off. 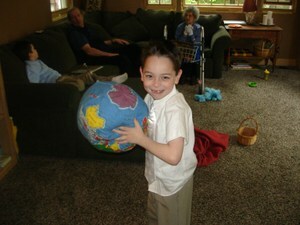 Today, CJ has the whole world in his hands! 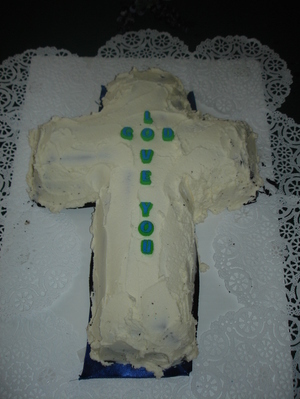 ... which was rather humble and homemade - but yummy! 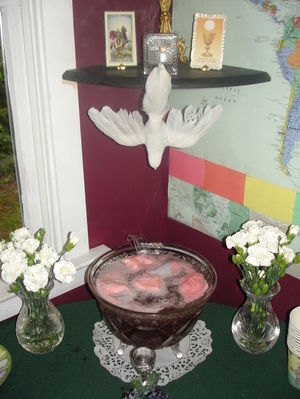 CJ requested a "Strawberry Sherbet Punch," so I made something up. Doesn't a punch just make a party? CJ was so surprised by the dove! ... and of course lots of freshly brewed coffee. Many of our family members could not make it today, due to a college graduation and a long-planned vacation. CJ missed them all, but knew in his heart how many people were thinking of him, praying for him, and just loving him all up today.